Anyone wanting to examine the stunning petroglyphs of Bangudae must first wade through the water of the Daegokcheon Stream, and then climb up the 30m (100ft) north-facing cliff. So, to make life easier for visitors, the Korean authorities have built a magnificent site museum a short distance away, with a stunningly accurate replica of the rock faces and their engravings, allowing you to study them at close quarters, at your leisure – and without getting your feet wet. For the real thing, you can follow the winding track through a small river valley, with its ancient spiritual associations reflected in the summit of a nearby hill. You emerge atop a slight elevation, where breathtaking views provide a peaceful contrast to the bustling energy of Korean highways and cities. Here, highdefinition binoculars await, enabling you to search the rock faces several metres away across the stream. It takes a while to decipher the engravings from the natural configuration of the rock face, but you can see enough of the friezes to whet your appetite. Bangudae’s rock engravings, covering an area about 3m (10ft) high and 10m (33ft) long, are a relatively recent discovery, and studying them was a challenge. A dam, built downstream in 1965 to supply water for nearby Ulsan – well known, of course, as the headquarters for the Hyundai car company – flooded the engravings for much of the year. 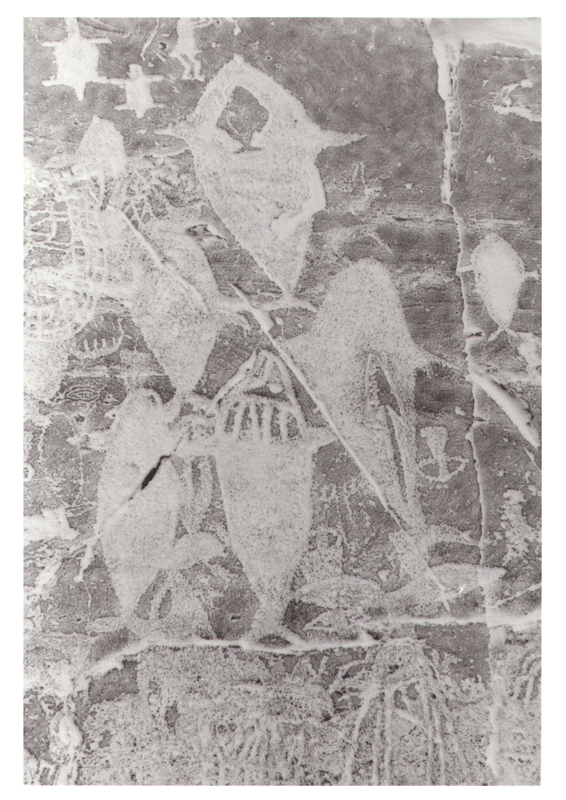 However, a major drought in 1970 allowed a detailed study of all the engravings, which was finally published in 1984. While, sadly, the rock engravings on the eastern (left-hand) side are much weathered, those on the central zone are much better preserved, to the tune of some 300 depictions. The carvers created them by chiselling the outline of the figure, then removing the entire shape. It appears that simple silhouettes pre-date the more elaborate figures, but superpositions are rare, as if the artists avoided them. I wondered how old they were: here, we encounter the usual difficulties of dating rock art of any kind – the lack of organic materials. Judging from the vivid depictions of whales, Bangudae’s engravings have clear associations with a whalehunting society living along the nearby coast, where whalebones are found in shell middens at Hwangseng-dong, in Ulsan, dating to between 7,000 and 3,500 years ago. This must be the general period to which the art belongs but, without occupation deposits or paint residues for radiocarbon-dating, we cannot date it any more precisely. 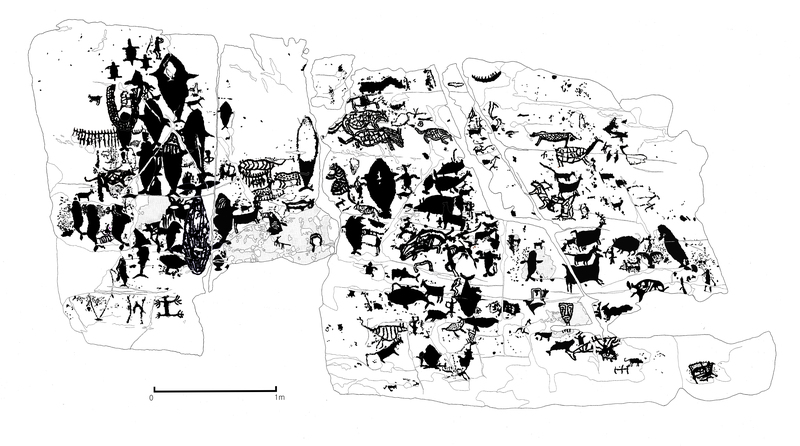 The whole frieze contains about 230 identifiable figures, animals and humans, giving a tantalising glimpse into the great diversity of this lost world. The petroglyphs include over 230 identifiable figures, including anthropomorphic figures, 75 different land and sea creatures, and hunting scenes, all mixed in with enigmatic symbols. Anthropomorphic figures appear in profile, all between 15cm and 20cm (6-8in) tall. Seven display a phallus, and some carry weapons, including a bow and a spear. One strange figure has outstretched arms and legs, while another has an anthropomorphic mask. Clearly, there was intense symbolism behind these human representations, as well as a general association with hunting activity. Nearly a third of the animal figures represent whales, viewed from above, and identifiable from their flat backs and dorsal fin, most with their heads facing upward. Some appear horizontally, perhaps representing dead individuals. Three are vertical, apparently blowing at the surface, the primary way in which Korean whalers traditionally identified their prey. It is difficult to identify individual whale types, but several blowing examples display the characteristic double spouting of the baleen, a whale that grows to enormous size. Others show the deep skin-folds from the mouth to the navel that are typical of rorquals, allowing them to engorge large quantities of food and water in a single gulp. Seven large whale figures appear to be swimming together, one carrying its young on its back so that it can take in air. Several others are shown on their backs, their bodies divided into what appear to be segments – similar to the stylistic representations of organs and skeletons shown on Australian Aboriginal paintings, and reminiscent of the butchery cuts made by Inuit hunters in the Arctic. The land mammals include wild pigs, deer, and wild goats, all shown in profile. Judging by their antlers, the deer include Sitka and giant stags, both highly valued prey for ancient Korean hunters. One of the swine displays the striped body of a marcassin, a young pig. There are also carnivores: three tigers identifiable by their body stripes, another possibly a leopard, and some with what appear to be wounds. As well as canids, both foxes and wolves, other animals include tortoises (rarely depicted on rock art anywhere), seals, seabirds, and two fish, one of which is definitely a shark. Looking at the friezes as a whole, it is striking that terrestrial animals appear in profile, while whales are engraved vertically. This may be a function of the ways in which the artists observed them in nature. Marine animals appear on the left of a natural fissure that separates them from predominantly terrestrial animals to the right. Sangmog Lee, Director of the Ulsan Petroglyph Museum, believes that the division represents a symbolic demarcation between the land and the ocean. At the same time, the engravings may commemorate the seasonal round of the hunters, who preyed on whales during their spring migration from the south to feed off plankton-rich waters in the arctic during the summer. One glyph shows two mustelids, perhaps weasels, mating, which they do in January and February, perhaps a sign of seasonal activity at the rock face. Lee believes that the Bangudae artists may have worked during the winter months, the season of shorter days and less hunting activity, when ritual activities might well have been important. The engravings of whales – one with what looks like its young riding on its back, another appears to have been stabbed with a harpoon. The petroglyphs also tell us something of the whale hunt. There are at least five whaleboats, manned by between five and 18 people. The tools and weapons of the chase were made of wood and other perishable materials, so nothing survives. Fortunately, there are depictions of harpoons and skin floats, known from modern sources to be made of whale hide, as well as representations of what appear to be palisades that were presumably part of coastal fish traps. Ulsan has been a centre of whale hunting for thousands of years, beginning as early as 3,000 years ago, before agriculture became established in the region. It has always been a seasonal activity, for whales are absent from Korean waters during the winter months. We should not be surprised at the emphasis on the whale hunt, or on dangerous terrestrial beasts. Elaborate rituals have surrounded land-based and maritime hunting throughout the North Pacific region for thousands of years. Lee stresses that there are some similarities between the Bangudae petroglyph traditions and those known from as far away as northern China, Mongolia, and Siberia – especially in the display of pregnant animals and sexual symbols, presumably connected with fertility. I was struck by the emphasis on whales and whaling, something that one finds in distant Alaska. Some years ago, I wrote (CWA 27) about the rock paintings of the Lake Clark National Park region south-west of Anchorage, preserved in rock shelters where whale captains performed hunting rituals, commemorated by paintings of whaling boats and their crews. The LakeClark paintings evoke powerful oral traditions of the complex rituals that surrounded the dangerous pursuit of whales. Intense symbolism and complex beliefs appear to have surrounded whale hunting over much of the North Pacific, even if there was no direct contact between widely separated whaling traditions. The Bangudae engravings remind us of the remarkable skills of such ancient whale hunters, who attacked the world’s largest beasts with the simplest of weapons, relying on their knowledge of their prey and acute observational skills, as well as complex, now forgotten, rituals that provided powerful validation for the chase.